Phi Phi and its neighbouring islands with their cathedral-like limestone cliffs are like nowhere else on earth. 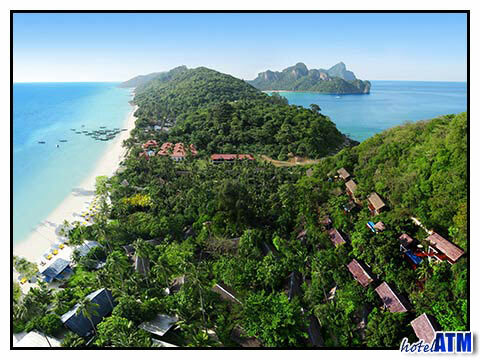 There are two Islands; Phi Phi Ley the smaller and setting for "The Beach"; and Phi Phi Don, home of the brand new Zeavola Resort & Spa. Pristine white beaches, pale sapphire seas and a beautiful climate promise everything for the castaway. But its much better than that! The all-suite Zeavola envelopes you in a fusion of luxurious comfort and the primeval beauty of its setting. The roomy suites are beautifully furnished and scented with the 'charms of rural Thai'. The spa will relieve you of all stress and strain reuniting body and mind as only the Thais know how! There is a PADI-certified diving/sport centre so that you can explore the reef and all its myriad colours. Dining, too, is a delight! The cuisine includes authentic Italian, seafood al fresco and Thai tidbits served all day while you chill out with a refreshing drink. The Zeavola Phi Phi Resort features in our Top 10 hand-picked hotels for 2 categories, including Best Beach Front Resorts on Phi Phi, Best Honeymoon Resorts on Phi Phi.